One of the horrendous mistakes made by pool owners today is to overlook the right level of alkalinity, and this is what brings its safety into question. There are so many things pool owners are required to look after. For instance, the surface of the pool, the plumbing part and a lot of relevant equipment. Now, if the alkaline level is not sustained correctly, each of these might undergo severe damage. Moreover, this can take a toll on your health adversely. So, the most important thing is to adjust the pool’s alkalinity in such a manner that there is no possibility of eye or skin irritation, no matter how long you wish to stay in the waters. What are the Reasons for Lower or Higher Alkalinity in a Swimming Pool Water? How to Adjust Total Alkalinity or PH Level in your Pool? How To Lower Alkalinity In Pool? How To Increase Alkalinity In Pool? What determines the freshness and purity of your pool water is its Ph scale. Unless you measure the accurate Ph and chlorine values, you will never be able to judge the quality of the water present in the swimming pool. The term Ph indicates the measurement of how acidic or alkaline is the water. As a matter of fact, the Ph scale ranges from 0 to 14. Where Ph 7 is considered to be neutral, water above Ph 7 would be considered alkaline (basic). If the Ph value of the water is below 7, it would be taken as acidic in nature. So, it is 7.4 that is considered to be the optimum Ph value. Interestingly, this Ph value is equivalent to that of our mucous membrane and even our eyes. The consequences of high alkalinity in pool water can be quite unpleasant. Skin irritation is one of those terrible consequences of high Ph value in pool water. This is one of the reasons many people end up with skin complications. Secondly, there is a lot of cloudiness and also lime precipitation that makes it quite unhygienic for users to swim around. In addition, there might be reduced chlorine effectiveness and also difficulty in fetching PH readings. As far as the consequences of water having low Ph are concerned, these too can be quite unpleasant. For instance, the water quality can be too aggressive resulting in destruction of the pool’s mechanical components. Skin and eye irritations are once again the similar consequences that can be caused due to low Ph value in pool water. Even the pool liner and pipes can undergo major damage for having Ph lower than 7. In contrast, water with the optimal Ph value of 7.4 results in strong chlorine disinfection. The sensitivity of water present in a swimming pool matters a lot for owners. Significantly low or high alkalinity levels can have a drastic effect on the person lying on the pool. Well, the blunder happens mostly during the initial stage when the pool is first opened for use. During the spring season, the pool owner often stays perplexed in setting the degree of alkalinity. It so happens that they end up enhancing the level past 120 ppm. Also, there are some uncontrollable factors responsible for the major rise in the water’s alkalinity level. For instance, there are certain areas where the level of alkalinity is higher in comparison. So, just when your pool is about to be filled up for the first time, the alkalinity level needs to be adjusted. In other words, you need to bring on the right balance in the alkalinity level, or otherwise, the consequences are never going to be pleasant. Note: Before going to winterize your pool, you should also adjust pool alkalinity and chemical balance. Otherwise, It will be tough to adjust in the next season. Setting up a pool full of water for swimming doesn’t actually meet your purpose. Testing the pool water’s total PH value is extremely essential. This is a big reason why plenty of pool owners today go with the idea of using pool test kits. For this, what one requires is the sample of water taking help of a water collector. In this case, one should fetch water from a depth of 12 to 18 inches. Once done, the reagents should be added to the water along with a minimal amount of chlorine neutralizer. This would definitely bring you the accurate readings of the pool’s total PH value. 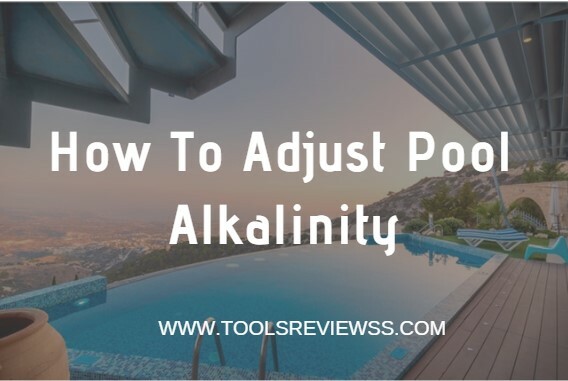 If the readings say that the alkalinity level of the pool is higher than what it should be, it has to be lowered by all means for sustaining balance. Similarly, if the level reads lower, it should then be adjusted and raised accordingly. If the Ph value or alkalinity is found to be on the higher side, the best way to lower it is by using Muriatic acid. What you need is to make an estimate of the required amount by means of a pool calculator. Turn on the water pump and ensure that it is running at the highest level. Do this while you are adding muriatic acid to the pool. Try distributing the muriatic acid as much as possible around the pool, which would resultantly safeguard your pool equipment and surfaces as well. Make use of the pump so that it helps the acid to evenly spread and help other particles dissolve in the pool. Keep tracking the PH level of the pool on a regular basis. It would be best if it can be monitored at an interval of 6 to 12 hours. Get complete protection for your eyes as well as your hands while adding sodium bicarbonate to the pool. Make sure to turn off the water pump. Once done, spread the chemical well deep inside the pool. Try adding the chemical slowly. Once done, try sinking a handful of it into the pool. Give a couple of hours to allow the chemical to get completely dissolved in water. Once done, switch on the water pump. Storm and large debris have a big effect on your pool chemistry. So after a big storm, check your pool chemical balance with a water testing kit and re-adjust it by following the above step by step process. It's a good practice to clean the pool frequently to remove debris and leaves. You may clean it manually or with a automatic pool vacuum cleaner. Pools look best when they are safe, and in order to assure the same, you should always measure the Ph level of its water. So, if your pool is already set and waiting for sufficient water to cover it up, make sure it comes along with the standard Ph level. If you are not sure about it, call an expert and get things sorted before your loved ones fall prey to skin problems. The cleaner and safer your pool, the better it is in terms of health and happiness. Hayward Aquanaut 400 Review: Does It Good Enough To Clean Your Pool ?